I wonder what Jesus of Nazareth would make of the god we have created from our distorted images. What kind of petty, sadistic god would engineer the birth of, foster the life of, and then engineer the death of a beloved child? Surely such a god is no more than a wicked illusion of our own making. I wonder what Jesus would make of our Holy Week commemorations. I suspect that if Jesus is anything like the accounts of his life suggest, or his teachings imply, then Jesus would be mortified. I do mean that literally…I think that Jesus would be mortified…mortified which actually means “shamed to death” … Jesus would be shamed to death by what has become of his life’s passion. For if Jesus’ was passionate about anything, it was not about dying as some sort of sacrifice; Jesus was passionate about life. Jesus declared, “I have come so that you may have life and live it abundantly.” Jesus was passionate about living; living fully, living abundantly. Jesus was passionate about creating a world where everyone could live life fully and abundantly. 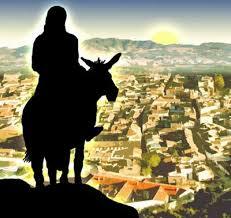 Jesus went from town to town urging people to live. Jesus struggled to free people from their narrow understandings, to open themselves to the wonders of creation, and to love the Creator, who Jesus called Abba, by loving what the Creator loves; loving not only their creator, but their neighbours, their enemies, and there very selves. Jesus embodied LOVE in ways that continue to provoke love in those who follow Jesus’ way of being in the world. Indeed, Jesus way of being inspired his followers to define the MYSTERY that we call God as LOVE itself. Jesus was so in tune with this LOVE that he was able to say, “I and the Abba are ONE.” Jesus believed himself to be ONE with the MYSTERY that is the LOVE we call God. Jesus was so open to the power of the LOVE that is God that he was able to live his life fully without fear of death. Following Jesus is about opening ourselves to the power of LOVE and living our lives fully without fear.The kind of LOVE that Jesus embodied and taught has no boundaries. No darkness, no power, no fear, not even death can limit the power of LOVE. For if LOVE is limited by death, then love will always be qualified and quantified. That Jesus was willing to LOVE without boundaries came at great cost to himself. But Jesus was willing to pay that price to show us the way; the way to LOVE without limit, without fear, without boundaries. LOVE without boundaries is abundant life. That Jesus’ LOVE could not be destroyed, not even by the thing we fear the most, death itself, saves us from the need to fear death. Jesus has shown us the way. It is possible to live abundantly lives that are free from the fear of death.So, why do so many of our Holy Week traditions appear to wallow in death? Why do lines like, “Jesus died to save us,” or Jesus is a “sacrifice for the redemption of sin,” echo down through the centuries trapping us in visons so replete with judgement and vengeance from a punishing god that seems obsessed with exacting a blood sacrifice? Each year it becomes more and more difficult to make the arduous journey to Jerusalem.It is as if we have confined the very events, we seek to commemorate during Holy Week, to the realm of a past we have long since grown out of as a species.As long as we see Jesus’ life and death as little more than bargaining chips in a cosmic battle for our souls, it is difficult to see the ways in which Jesus’ life and death continue to speak volumes to those who are passionate about the very things that Jesus was passionate about.Jesus was so passionate about his belief that living life abundantly, without fear would lead to justice that in turn would lead to peace on earth, that he was willing to live his life as the embodiment of the LOVE that is God. Jesus died not for our sins, but to show us the way; to show us that LOVE’s ways are not our ways: that our ways of greed, injustice, self-centeredness, and violence lead only to violence, war and death. But Jesus’ ways of love, grace, and justice lead to peace and life. Jesus believed so passionately in the ways of love, grace, and justice that he was willing to live a life that embodied love, grace and justice so that all the world could see the way to peace and abundant life. That we should look upon the cross and see only the symbol of our personal salvation is a travesty that fails to see the magnitude of Jesus’ life and witness. How can we fail to see the truth that Jesus’ life and witness were so powerful that death could not contain them? Why do we find it so easy to forget that in Jesus’ teachings those first followers of the Way were so moved by the power of Jesus’ life and witness that when they looked upon the cross they saw the Christ, the anointed one, the very face of the LOVE that is God revealed in the flesh? It is as if our preoccupation with our own personal salvation has blinded us to the reality of Christ? We need to broaden our vision to see that there is more than one Jerusalem; more than one place where people are being oppressed by the forces of empire. As long as there continue to be places where the powerful cause the powerless to suffer, we must be prepared to parade into the heart of our jerusalems to expose the forces of empire. We need to see Christ crucified in order to see the terrible reality that Christ continues to be crucified over and over and over again. For just as surely as Christ died upon the cross, those who follow the ways of Christ, the ways of grace, of justice and peace, those who embody LOVE, continue to be tortured, battered, abused and hauled up upon crosses and executed by the forces of darkness, violence and death. The crucifixion didn’t happen once and for all, way back when. Christ is crucified over and over again as the ways of greed, self-centeredness, violence, war and death exact their punishment on the innocent victims of the world. Christ is crucified all over again when calls for peace through justice go unanswered. Christ is crucified all over again in the countless deaths that are claimed by our lust for power and quest for stuff. Christ is crucified all over again when creation, scarred and wounded is poisoned by our arrogance and greed. Christ is crucified again and again, when we fail to see the face of Christ in our sisters and brothers of every clan and race. Jesus was passionate about his desire that we should have life and live it abundantly. Jesus was passionate that the way to achieve abundant life for all of Creation was through justice because justice and not violence is the way to peace. Jesus was executed precisely because the ways of justice and peace threatened the empire’s ways of peace through violence and victory. The powers that be sought to conquer their enemies rather than love them; to vanquish and kill their way to apeace that could only be maintained through even more injustice; this kind of imperial peace based upon the power of empire was only peace if you could number yourself among the conquerors, the victorious, the strong, and powerful and no peace at all if you were among the weak and powerless. Jesus took a stand on the pathway that leads to peace and the powers that be nailed him to a cross believing that his death would ensure their power. But Jesus’ life and witness were so powerful that in Jesus, people saw the face of Christ, and death could not and will not contain Christ. The powers of darkness will have their day. But not even death can contain Christ. For Christ comes again and again and is embodied in those who work for peace through justice, grace and love. We humans are fearfully and wonderfully made. We are capable of causing so much suffering, destruction, pain, and oppression. But we are also capable of peering beyond, the beyond, into the farthest reaches of time and space, and now even spacetime – the place beyond time itself. 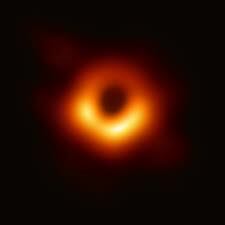 One of the things I learned this week about that photograph of the black hole that has so enthralled the world is that the photograph itself is not actually a photograph of a black hole at all, because photographs require light and light cannot escape from a black hole. What we are all so enthralled by is actually a photograph of what is called the “event horizon”. “They” say that an event horizon is the imaginary surface around the black hole that marks the border between our universe and that which is unknowable. That fuzzy orange doughnut pales in comparison to the reality that is a black hole, just as surely as our miss-rememberings of Jesus pale in comparison to the reality of the LOVE that is embodied over and over again in those who have the courage to parade into the jerusalems in which the oppressed continue to suffer. Let us have the courage to follow Christ into our jerusalems trusting that not even death can destroy the LOVE that lives, and breathes, in, with, through, and beyond us; the LOVE in which we live and move and have our being. Blessed is the ONE who comes in the name of the LOVE that is the MYSTERY we call God. This entry was posted in Adult Education, Bible Study, HOLY CROSS LUTHERAN, Progressive Theology, SERMONS, STORIES, Theology and tagged Palm Sunday sermon, progressive christian theology, progressive Palm Sunday sermon, Progressive Sermon Palm Sunday C by Rev. Dawn Hutchings. Bookmark the permalink.